Our bathrooms most certainly occupy a very important space in our homes and our lives. They are where we cleanse ourselves, apply make-up, shave and often times, take a relaxing shower or soak. So quite obviously, it is important to have correct lighting in order to make these daily routines both efficient and enjoyable. As luck would have it, you can ensure your personal comfort and efficiency and control exactly how your bathroom environment is illuminated by an understanding of two simple forms of bathroom lighting. 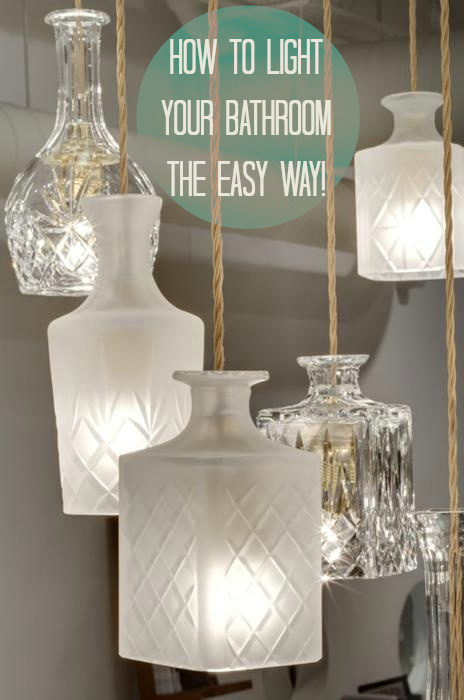 Task lighting or vanity lighting is perhaps the most important form of lighting you will need to consider when deciding how to illuminate your bathroom. Vanity lighting fixtures are generally fitted around the mirror and their main purpose is to provide light for the head and face during grooming. Unfortunately, people often make the mistake of installing task lighting directly above the mirror and grooming area. Much to the dismay of the user, this method casts distinct and undesirable shadows over the face. Not only does this make it much harder to groom effectively within a given time frame, but it certainly isn’t flattering either. The general rule of thumb is to use small lighting fixtures on either side of the mirror. This method will give a far more balanced and gentle source of vanity light. Effectively a substitute for the lack of natural light, ambient lighting is the primary source of general lighting in your bathroom. More often that not, ambient lighting will be provided by a single fixed ceiling light. From a practical perspective, there is perhaps nothing wrong with this. However for the more aesthetically minded, you may like to consider a chandelier. For the minimalist too, there is the option of cove lighting – a series of very discrete and indirect lights build into the ledges or recesses of your bathroom wall. But if indeed you are happy with simple style and practicality, simple LED spotlights can be very effective as well. Whatever your choice, be sure to maintain total control of your ambient lighting with dimmer switches. These will allow you to fully illuminate your bathroom on those dark mornings or alternatively, to keep intrusions of light to a minimum on those mornings when you might be feeling just a little bit delicate. Be warned. If you are thinking of installing some new spotlights, ceiling lights or any other type of light fixture in your bathroom, be sure to buy quality products from a reputable supplier such as Scotlight Direct. The last thing you want is to invest in a new range of lights, only to have them break within a few months! I love the lighting in the picture where do I find it ?